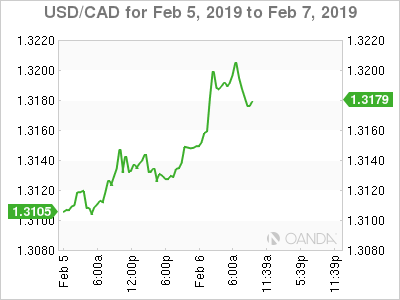 USD/CAD continues to move higher this week, and has posted considerable gains on Wednesday. Currently, the pair is trading at 1.3180, up 0.41% on the day. On the release front, Canada releases data for the first time this week. Building Permits is expected to slip 0.9%, while Ivey PMI is projected to slow to 56.4 points. With no major events out of the U.S., the markets will be focusing on Federal Reserve Chair Powell, who will speak at an event in Washington. On Thursday, the key event is U.S. unemployment claims. The markets didn’t show much reaction to President Trump’s State of the Union address on Tuesday. The speech was almost cancelled to the recent government shutdown, and the President spoke of the possibility of another shutdown if his demands for funding for a border wall were not met. Trump spoke of the U.S-China trade war, reiterating that the U.S. would demand “real structural change” from China before a trade deal could be reached. American policymakers have long demanded that China desist from intellectual theft against U.S. companies, and with China experiencing a slowdown, the Chinese may have to make concessions or face further tariffs in March. With the Canadian economy showing signs of a slowdown, the mood of consumers remains fragile. Low oil prices and a weaker global economy have lowered demand for Canadian exports and weighed on inflation and wage levels. Consumer confidence is a strong barometer of the economy’s health, and if weaker consumer sentiment translates into decreased consumer spending, the economy could falter and drag down the Canadian dollar. Meanwhile, the Bank of Canada appears to have taken page out of the Federal Reserve’s playbook, and is expected to ease monetary policy this year after aggressively raising rates in 2018.